After some success with a planted nano aquascape, PFK's Nathan Hill tries something bigger — only to hit every obstacle on the way. Here at PFK we need to keep fingers in many pies. After spending so long playing with biotopes, marines and species tanks, I felt it was high time I hopped on the aquascaping bandwagon and gave the artistic side of fishkeeping my best shot. I had a Fluval Studio 900 on long-term review and decided to put it to use. At 94cm/38” long it’s a good benchmark size. A depth of 55cm/22” also gave me plenty of opportunity to go for height, too. I’d had success with tall stem plants in previous tanks and could fall back on these if needed. The project was jump-started in July 2011 when PFK was visited by the Dennerle team, including 'scaping prodigy Volker Jochum. The members brought a huge cargo of Vesicularia on wood, Ricardia, Cyperus, and Pogostemon, as well as substrates and hardscape that I commandeered the moment they waved goodbye. Initially I’d had an iwagumi set-up in mind, a minimalist layout of low carpeting Pogostemon with little height. At the time I also had some Pogostemon sp. upright, as well as the Cyperus, so I improvised with a hybrid iwagumi that didn’t look too good. I started with the standard T5 lighting provided with the tank, one Life GLO and one Power GLO tube, and the supplied Fluval 305 canister filter. To this I added a Dennerle CO2 set that had been left behind, and, starting a dose rate of two bubbles per second, I timed the lights for a constant ten-hour stint in tandem with the release of the gas. At this stage it all went wrong. What with the lighting and gas the water already had a faint tinge. Undeterred, I used EI salts, adding twice the recommended daily dosages. Combined with the Deponit Mix substrate fertiliser I’d already overdosed, the tank didn’t stand a chance. I started to fill gaps in planting by buying from many suppliers, mixing anything in desperation to get the tank looking good. Out of the blue I was hit with an almighty pathogen. A grey, furry growth, no more than 2mm/0.07” tall marched across and digested plants. Pogostemon were eaten within an hour, as were all of the Hemianthus and Staurogyne. As I tried to remove affected plants, I sent the pathogen systemic through the tank, until nothing, bar some hairgrass, Vesicularia, Echinodorus and Cyperus remained. Not long after I’d replanted the tank, using a mix from existing tanks, the tinge reappeared. It became increasingly worse and I tried to dilute it out, but it just fuelled a nightmarish descent into green water. The CO2 supply ran out and I opted not to replace it. Instead, I relied on Easycarbo as a carbon source and I also stopped using EI. I continued to change water. I tried 'miracle' algae cures and biological water clarifiers — to no avail. The algae growth was phenomenal. You couldn’t see beyond a few centimetres and after a 50% water change, the tank would return to a thick, rich green in under 24 hours. Then, without warning some three months later, it cleared. I’d toyed with the idea of using Daphnia to help, but, just as I prepared to get some, the tank reverted to a crystal state. It became sparkling overnight! The bonus for having endured the green water for so long was that the plants beneath had not only coped but were never as clean and clear of nuisance algae. There was not a single spoiled leaf and all the hardscape looked as though it had just left the store! 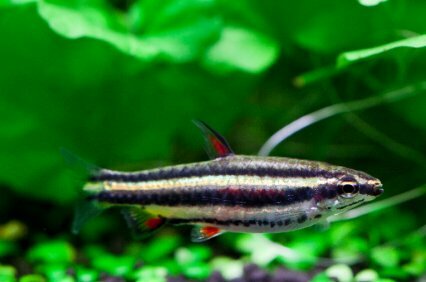 At the same time this clarity occurred I had set up a separate tank with Neon tetras, Corydoras, and four pots of Cardamine. I completely redesigned the planting layout, now using only the Cyperus along the back pane, strategically positioned Vesicularia on wood, tediously planted Glossostigma strand by strand, and my remaining hairgrass. Once ready, I transferred the Cardamine and fish from the smaller set-up and hoped to get some height from this new plant. With the tank now in a layout mode I felt happy with, and with my plants repositioned for the final time, I decided to up the filtration from the original Fluval 305 filter, and swapped for a newer 306 model with increased flow. Noticing the first strands of algae on the Vesicularia, I started to dose Algexit as a control. I even introduced a siesta period, turning the lights off for a four-hour interval starting at noon. Evidently, this is what the tank needed. The Cardamine did exactly what I didn’t expect. Instead of creeping upright, it formed a carpet that started to fill the gaps between rocks. Soon I was removing rogue strands and replanting them at the borders, gradually increasing carpet size. The Cardamine nicely followed the shape of the layout and loose strands could be strategically placed in gaps. The Vesicularia needed mowing weekly and this also helped remove a few inklings of algae that were forming. The Cyperus remained a slow grower, requiring the tips to be tidied after some discoloration. I let the hairgrass roam. Surprisingly, I noticed the return of some Ricardia, all of which I thought had died many months earlier. Tiny fragments clung to rocks and within weeks were quadrupling in size, creeping over hard surfaces in a way I thoroughly approved of. The tank is currently pretty much as I like it. Growth is strong, but the Cardamine is easy to control. The Vesicularia still develops an occasional skin of hair algae that can be easily trimmed off and, although most plant growth is healthy, it isn’t excessive or unruly. I’ve discovered that successful plant growth isn’t the domain of the rich, with endless money to throw at expensive CO2 kits – although for someone making a lot of mistakes it can cost a lot in greenery before things find an equalibrium. I’ve also discovered that simplicity can be key. My obsession with endless nutrients brought only headaches. And I’ve discovered that plants don’t behave as you expect them to! This tank is incredibly low maintenance. Being an aquascape, and having the Amano shrimps, I don’t need to syphon from the substrate — nor does it appear to accumulate any solid wastes. Water changes are performed either weekly or fortnightly, from 15-35% amounts, depending on my laziness. I have Peterborough tapwater, dechlorinated, but use no further treatment. The only daily chemical addition is Easycarbo, and between 5-10ml is added. Technically this is an overdose and much has been said about Easycarbo killing shrimps, but I’ve not faced this problem. Other nutrients include a weekly or fortnightly addition of Profito, Phospho, Nitro, Ferro, and Potassium — all at 15ml measures at a time. Algexit is added every couple of weeks to keep the hair algae in check, although I suspect this is now a placebo to calm my nerves about another potential disaster. Lighting is still the basic Power GLO and Life GLO, as supplied with the tank. Aside the Fluval 306 filter, there are no other working accessories. Lighting runs from 8:30am to 12:00pm and from 4:00pm to 10pm, controlled by a simple plug-in timer. What have I got inside the tank? Stocking is light, which forgives lazy fishkeeping and also relieves stresses if spending time away from the tank. As much as I’d wanted to carry a South American theme, there were too many waifs and strays finding their way into the tank. 12 Neon tetras (Paracheirodon innesi). Six Peppered corydoras (Corydoras paleatus). Two Microdevario kubotai, overspill from another project. Two Eyespot rasboras (Brevibora dorciocellata) which were only put in to save them from a CO2 accident in a different tank that claimed most of their shoal. 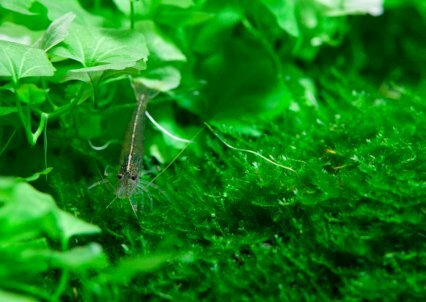 Six or seven Amano shrimp (Caridina japonica) to control algae spots and clean up. How much to set up or replicate this tank? Choice wood from previous tank set ups — Free! Planting tongs and scissors — approx. £17.98 for both, pending individual retailer prices. A few weeks of patience to grow and harvest plants — Free! Here's a video of Nathan's set-up.